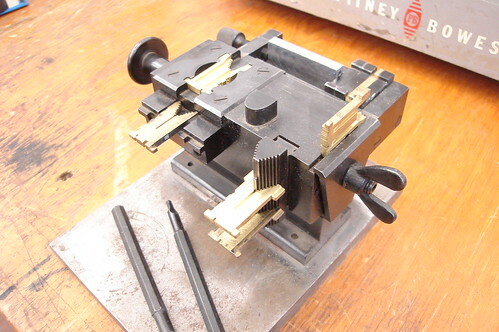 This shows the "try" gauge for checking wear on the teeth of a matrix. The matrix on top is brand new, (though made in 1929 according to the date code on the matrix), and the lower mat has been used. If the mat will pass the entire length of the bar, then it is too worn for practical use. The new matrix is 8 pt Garamond.